Kadai is a cooking pot used by people in India and neighboring countries to cook and deep dry vegetables, snacks and non vegetarian cuisines. 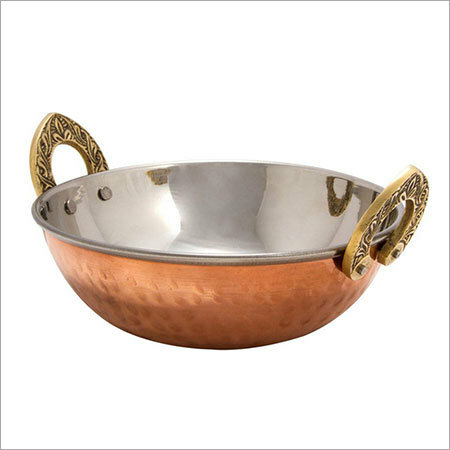 This circular, deep kadai with round bottom has steel inner lining, hammered copper outer lining and beautifully crafted handles riveted at both sides. Several dishes prepared in this copper steel kadai, there names reflect its use, such as kadai panner, chicken kadai, mutton kadai, and dumba kadai. These are served with naan- a flat bread baked in oven.